I GREW UP AS A JEW. I attended synagogue from my youth up until college in an upper middle class Jewish environment. I attended Sabbath services regularly every Friday night and Saturday morning from childhood until the age of 18. When I was 21 years old, I became a Christian, having read the New Testament for the first time and was captivated by the Person of Jesus Christ and His claims of being the Messiah. I am now 57 years old and have no regrets of becoming a Christian but rather I thank Christ everyday for this great privilege. 1. The International Association of Jewish Lawyers and Jurists; 2. 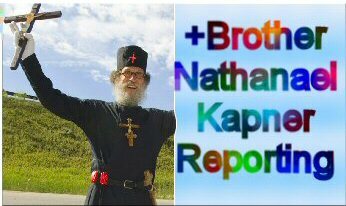 B’nai Brith (”Sons of the Covenant”); 3. Jewish People Policy Planning Institute. To be a “Jewish” lawyer means nothing more than that lawyer identifies himself with the social grouping known as “Jews.” Most Jewish lawyers are secularists. Yet they tacitly subscribe to the religion known as “Judaism.” What then does “Judaism” mean for the secular Jewish lawyer? It could only mean belonging to a racial club. Even your ultra Orthodox Jew, who indeed practices Judaism, is against proselytism of Gentiles, thus demonstrating the racial nature of Judaism. Zionism is dedicated to the establishment and perpetuation of a Jewish homeland. Yet most Israelis are atheists. The Jew points his finger at ‘White Society’ and calls the founding fathers of America, “racists” and pushes for open immigration of Third World nations that we may have a multi-racial society. But the Jew will live in his wealthy suburban neighborhood, *apart* from that multi-racial society. 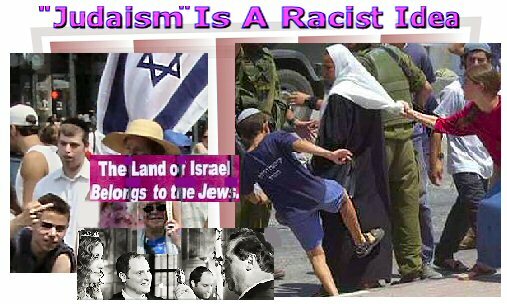 And the Zionists are dedicated to a single racial citizenship of the State of Israel. Judaism, as the rabbis say, is the belief in one God. Add to this various rituals, rules and regulations mixed in. But essentially, Judaism is the promotion and preservation of the Jewish race. For in Judaism there are 3 major differing branches: 1. Reformed; 2. Conservative; 3. Orthodox. Reformed Judaism is secular; Conservative Judaism is something between the other two; Orthodox Judaism is focused on rules and regulations more than love for God. How then can all three branches, differing as they do, claim and be recognized by one another, as espousing Judaism? I will tell you why. Because Judaism is nothing more than the advancing of the Jewish race more than it is of a belief system. For if Judaism was really about a belief system then Orthodox Jews would not oppose proselytism among the Gentiles. — “You can live a perfectly decent life not being Jewish but I think you’re losing a lot - losing the kind of feeling you have when you know that throughout the world there are people who have the same kind of DNA that you have.” — Here. JUDAISM IS A RACIST IDEA because one can be an atheist and still be considered a subscriber to Judaism. Make no doubt about it - a Gentile who converts to Judaism is considered a second-class citizen by Jews. And it is the Gentile, the “goy,” with his Christianity, that the Jew in his audacity will label a racist offender. Is it not time that we tell the Jews that their racist hypocrisy will not gain currency amongst us any longer? before the Jew whose racist Judaism is the true cancer of the Western world? I think there was a Jewish holocaust during the second world war. There is increasing evidence that the Zionist executive intended to offer a holocaust of European Jews (at the hands of the Nazi state) who did not obey the summons to ‘return’ to the land of Israel and settle the land. A lot of historical evidence for this. The political goals of WW II were afterall: establishing the state of Israel, the U.N. as the basis for world government and to redraw the map of Europe by imposing Communist totalitarianism on Eastern and Central Europe. This was a condition for the destruction of the Christian East: the Orthodox Church of the Slavic nations, the Roman Catholic, Uniate and Melkite Rites and the independent Protestant congregations. The thelemic trance of the 6,000,000 souls is a Kabbalistic thing. No one knows the exact number of those who were murdered: Jew or Gentile. I do not invoke the trance, but I also choose to err on the side of respect by referring to the 6,000,000 Jewish victims. I think that civilized discourse should strive to show respect to all the dead of the vast killing field that was WW II. Over 3,000 Catholic priests, for example, were murdered in Dachau. I think attempting to prove that the Jewish holocaust did not occur is self-defeating and deliberately offensive whatever may be the eventual historical verdict of the means of death (at Aushwitz, for example) - which was a place of executions. The great Catholic evangelist Maximillian Kolbe died there by execution. Today the Jews are making a ‘Federal case’ against Pope Pius XII because of his silence on the Jewish holocaust. Yet, when the pope did speak out - as the Church did in Holland - retribution was swift. I think there is a lot of evidence that under the cover of silence, the secret orders went out from the Vatican to the religous foundations of Europe (especially the monasteries) to hide and protect the Jews. Many acknowledge this. I remember when he died, Time magazine reported that Leonard Bernstein, conducting in N.Y. paid personal tribute to him for his efforts in saving the lives of thousands of Jews by tapping his baton for a moment’s silence. I wish I had saved that article for my archives. What is really the bone of contention here is this politically correct discourse which assigns the deaths of millions of Gentiles, many Christian, to a lesser order of suffering and death or ignores it altogether. This has provoked a reaction of ‘holocaust denial’ that while understandable, fails to grapple with sheer number of mass murder that was the great killing field of WW II. And of course, to make of the Kabbalistic number of the 6,000,000 the basis of a true Occult Working for sweeping historical revisionism - laying at the door of the Catholic Church - all the evils of the age, foremost among them Anti-Semitism - this is quite frankly a lot of crapola. The millions of Eastern Orthodox Christians who were starved to death, were put in concentration camps, and mass murdered by Jewish communists in Russia, during Lenin’s and Trotsky’s and Stalin’s rule. This was genocide by Jews. Never forget the Christian Holocaust in the Soviet Union. The Jews have tried to erase this history of Russia. Yes, how come we never hear about the Ukranian Holocaust, the Armenian Holocaust, etc but only the Jewish one? Because the others have forgiven and chosen to move on, but it seems we need to remind that there have been many Holocausts among many people, and how is the Iraqi war any different, really? Will the Jews be happy when 6 million Iraquis are dead? It is amazing to me that Jews complain when they are identified as a race, but emphasize racial criterion in all aspects of their own lives. In short — only Jews are allowed to be racists, Gentiles cannot. I think Judaism is a beautiful religion stressing ethics and a belief in God. There is nothing wrong about that, in fact those two aspects are the central core of my beliefs. The problem however, is that when you get acquainted with the writings of the most important Jews (Maimonides, Baal Shem Tov) you come to realize that Jews do not look anything like the description their forefathers intended to. You see lots of racism among them, lack of education, and disregard for other peoples. Also I always hated the objectification of others, even to praise them. i.e. “Righteous Gentile,” it just reminds me of the Howard Stern show “Debie the Prostitute” “Johnny the Limo Driver” and so on. Objectification of human beings is bad, the belief in your group’s superiority is bad too.